THIS IS THE LAST PAGE, ENJOY IT!! Previously in Super Bounty J1: Secret Missions- J1 and the Panditos thought they had captured their latest bounty, Jammerhead the genetically modified Hammerhead shark, when it was discovered that the scientists had grafted a super laser onto his back. Why, oh why, would they do such a thing?? Now that Jammerhead has escaped from the holding truck, how is Super Bounty J1 gonna get him back in containment?? Will she net her bounty this time?? 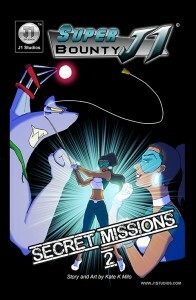 Click to see the exciting conclusion of Super Bounty J1: Secret Mission 2!